Nobody does, is my thought. Thanks for stopping by! The only New Year’s resolution I have ever kept was a resolution to NEVER make another New Year’s resolution again! That one, I kept. As for day-to-day goals? Mine are usually word-count oriented and my success rate is…variable. Still working on it. We all have to accept that we’re not going to meet every goal every day when they’re short-term like daily word counts. But as long as we accept those “failures” and move to catch up, such as by setting weekly or monthly goals as well, we can move forward. I agree resolutions don’t go far, and I agree we need to do better every day rather than on one day a year. With that being said, I do tend to evaluate what I want to accomplish during the year. Not necessarily a resolution so much as this year’s business model. Achievable goals. I’m a slacker. I don’t set annual goals, just “what’s up next” projects. Until I get a deadline! Good reminder that we need to make every day count. And that means spending less time on the computer and more accomplishing the things on our personal to-do lists. Guess I’d better stop playing those games! But true, we do get locked into the ‘screen’ and need to broaden our daily horizons. I need to become more goal oriented. You can start any time. I recommend starting with small, attainable goals. I am ridiculously goal oriented and try to make little adjustments in order to keep on track. I don’t make resolutions, but I choose a word to help me improve. This year’s word is FOCUS. So far, I love it. Thanks, Maggie. I overheard a conversation at the salon, and they were saying how a client’s husband had passed unexpectedly. We really can’t know what tomorrow will bring. And glad you enjoyed Seeing Red! 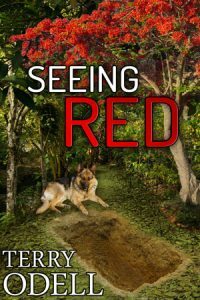 I would like to have a copy of Seeing Red. Thanks for commenting, Barry. Good luck.